A relaxing stroll through the downtown area to discover the history of Rome and its traditions as well. 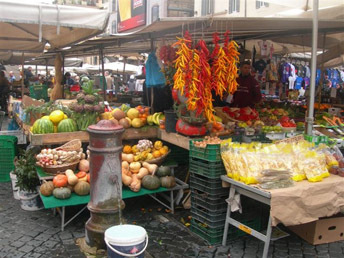 Campo de’ Fiori, the historic open air market where locals still buy fresh fruit, vegetables, flowers, spices. Definitely a sight to behold and taste. The busy piazza is crawled with bars, wineries, bakeries where people sample the world famous roman pizza straight from the oven: plain or filled it is delicious. Our walk takes us through the Jewish Ghetto where one can enjoy the traditional cakes of the Roman-jewish cuisine, then onto alleyways and small places to discover the old cornershops, family run stores and the inns where people still gather to sample the local cured meats and the selection of cheeses, and finally calling it a day roman style with an excellent granita di caffé (iced coffee slush with whipped cream) or with the local grattachecca a real thirst quencher: shaved ice directly from the slab and dressed with fresh fruit, juice or syrups.